This entry was posted in Demographics, Economy. Bookmark the permalink. North Carolina, PA, and Florida don’t tax FEDERAL retirement. Given the large number of USG workers in VA, it makes sense. I looked at moving to NC — but it was too far from my friends and activities in the Valley. FLA is too flat and lacks seasons and is way too far south. And PA — wrong side of the Mason-Dixon line. If the Commonwealth wants to keep those exiting for retirement…. do the same as these states. bigger picture… retirement – to less winter and lower taxes? All of the above states do have sales taxes.. but retired folks have discretion over how much “stuff” subject to sales tax they buy. One thing Virginia should do is make sure that retirees have the full story. On the surface the kinds of retirees who can pick up, pack up and relocate seem to be the kind of people we need to keep in Virginia. I assume most of them have savings, 401(k), pensions, etc. They may not pay a lot of income tax but they pay real estate taxes, sales taxes, personal property taxes, etc. Of course, in the case of 401(k) they pay income taxes too. They don’t have young children who attend public schools, they generally don’t commit crimes, their healthcare is covered. My guess is that the retirees who are leaving are net generators of funds to the state. Has anybody ever looked at whether state estate taxes matter to the majority of retirees? Agreed, retired households that are affluent enough to move to another state are undoubtedly net contributors to state/local taxes. Surely there must be a body of research that has examined what factors nudge these people into leaving or staying. What the numbers seem to say is that if some counties in Va were willing to lower their property taxes for seniors and communities for seniors that they might stay in Va… if other amenities were there. That might well be a win-win for some of the rural counties in Va that don’t have other economic development opportunities. 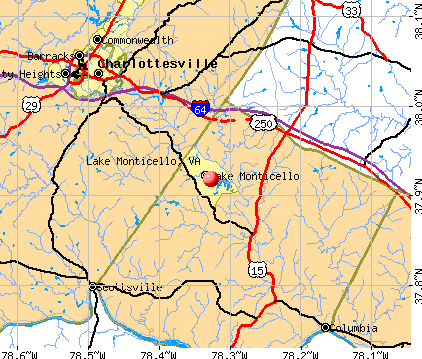 Lake Monticello comes to mind outside of Charlottesville.. and it’s got a big plus in that a world class Medical center is near by also plus cultural events and activities. you need services.. libraries, fire/ems, hiking/bike trails, ball courts, golf, a decent higher end grocery store , etc.. The United Van Lines report is useful to look at, but it is important to consider that it likely doesn’t include many young adults who don’t have enough belongings or money to hire a moving company. The IRS migration data shows that a lot of the people leaving Virginia are young adults who are probably looking for a better job or cheaper housing. Jim’s point about Virginia losing retirees is a developing trend. So much of the growth Virginia has experienced since WW2 was from people moving in from up north. With Baby Boomers starting to retire it makes sense that they might want to move somewhere warmer and cheaper or back to where they grew up. There is also a large amount of migration from Virginia’s urban areas to its rural areas by retirees:http://statchatva.org/2013/11/25/retirement-patterns-anywhere-but-cities/ but I imagine many grew up in rural Virginia. Good point about the young adults not hiring moving companies. That was true of me when I was young, and it is true of my kids. You rent a truck and recruit your family/friends to help you move. StatChat show no great intermal Virginia migration of retirees.. but two things are certain – they are retiring and they ARE leaving places that are expensive and have hellish traffic. So is Virginia getting it’s share or is there something other than more warmer weather than Virginia is getting outcompeted on? We get integrated communities that have “active adults”, “assisted care” and nursing homes.. It will be interesting to see how many upper income retirees move to Tysons to get away from the big house, yard work and have access to Metro and, presumably, children and grandkids. So far, the builders have not offered many condos. I think they would be a greater draw than apartments – especially when the rent for many well-appointed studios hits $3000 per month. In McLean we are seeing a number of such retirees clambering for condos in McLean. Most don’t want to live in Tysons, but I’m not sure I buy that because of the general lack of condos in Tysons so far. With more condos in Tysons, one would think a lot more downsizers would move to Tysons. The desire for more condos in McLean is creating a bit of a backlash as more development means more traffic in a place being crushed by commuter traffic. How this all plays out should be interesting. While I know a number of wealthy retirees who have relocated to Reston condos I know more who have moved to Charlottesville. I think the addition of wealthy retirees is going to be more of a potential positive for small town / small city Virginia than for Tysons. One thing retirees universally want is access to good healthcare. NoVa has such access but so does Charlottesville. What other areas in rural / small town / small city Virginia can provide the healthcare retirees demand? It seems to me that attracting well heeled retirees is as good an economic development plan as tourism or any of the other ideas I’ve heard over the years. I’ve always thought it would be very positive for Tysons to lure a major health care facility (not the “bucks’-up-front” emergency care centers or the various private practices in Tysons), but a major facility such those run by INOVA or the Mayo or Cleveland Clinics. So far, nothing. Maybe it’s not reached the population level necessary to attract such a center. Or it could be no one has tried. I suggest the secret to understanding these numbers lie in what is going on in Northern Virginia. Likely it is still a magnet for the young affluent and migrant looking for work. Likely too many somewhat older people are leaving Northern Virginia, including those just moving across the Potomac, to find better places to raise a family, and for a better far more convenient life style. And of course many baby boomer people are leaving northern Virginia to escape the rat race and retire, or partially retire, typically down south. My analysis of the IRS data shows that the middle-income class is being thinned out in Fairfax County (http://www.fcta.org/Pubs/Reports/2014-04a-fac.pdf). Some may move up in salary and some may move down. My retiring friends on government pensions are staying. My retiring friends not on government pensions say they are moving to a lower-cost area. We have a TON of people in the Fredericksburg Area who say they cannot afford to live in NoVA. They have “no choice” but to work in NoVa and live 50 miles south and drive that hellhole of a commute every day. We get folks down here that sell their houses in NoVa for 500K to a million. they move down here and use 1/2 of it to build a house twice as big as the one in Nova and they then pocket the other half. But they are complainers.. they complain about everything. I think they got in the habit of complaining when they lived iln NoVa and now it’s parts of their DNA. No sympathy. They’re living high on the hog compared to folks who have lived here all their lives and the come-heres think they are God’s gift to everyone else… who ought to be thankful..
Well “everyone” from NoVA is transplants. Upon retirement a few years ago, we were planning to move back to NJ/PA to be with our children and grandchildren. In an unexpected change of plan, they moved here from NJ instead. Therefore we should a tax credit? One complaint that forces people back out of NoVA is taxes, especially car tax is a big bite if you buy that nice $40K+ car (or should I say F150 pick-up). If you always lived in NoVA you keep you car dreams modest by necessity. Chap Petersen does not like that tax either. PS- I’d build on that to say the Va. policy really seems to be to take advantage of transplants, eg; shifting overall tax burden to NoVA. I feel that way. So then transplants do not feel welcome, and leave, and then we tax the fact they are leaving. Wonderful treatment. A late comment here: most of my retiree friends are choosing their location for Golden Pond on the basis of : (1) where are the kids (and the grandchildren); and (2) the burden (offset by the substantial challenge and fun) of “starting over” to make new friends in a new community; and (3) taxes/cost of living/an available medical facility — in that order. No. (2) moves up on the list if they already have a second home foothold in the new community, which may have been chosen with taxes in mind; and No. 3 moves up mainly if the medical threat is imminent. So I would give only a limited nod to tax incentives in (3) as a determining factor.